Turkey, goose and rib of beef get so much attention on the Christmas lunch table, but sorry guys, necessary as you are to a fabulous celebration, you would be nowhere without the side dishes. They may not get top billing, but these precious supporting acts are just as important. The British love their sides and here are 10 of the most popular ones that no Christmas lunch would ever be the same without. 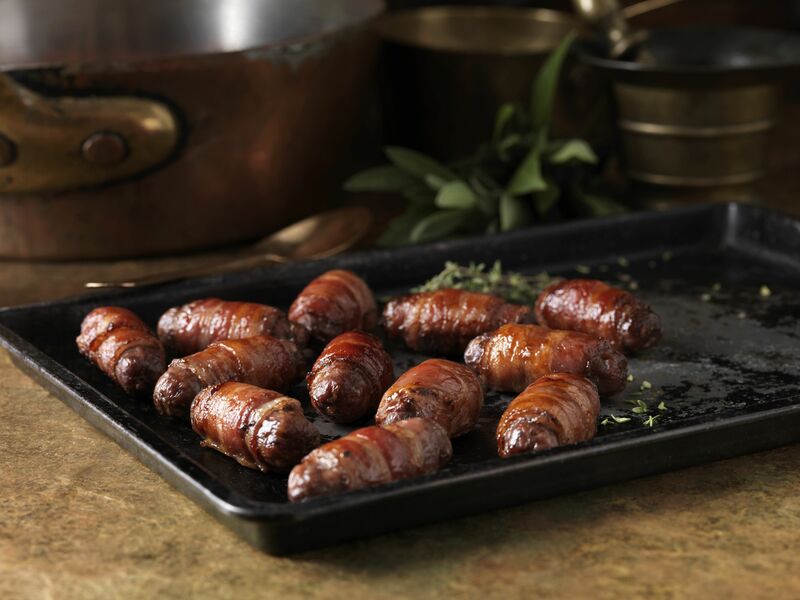 These little beauties of Chipolata sausages wrapped in streaky bacon are the must-have accompaniment to turkey or goose. Due to the lovely richness of the sausage-bacon combo, this side works incredibly well with the soft flavor of poultry. And while it is less likely to be served with a rib of beef, there are those who would dare to live on the wild side and do it anyway. Either way, we salute you for your choice. Hard as it may be to believe, the Brits eat four billion sprouts at Christmas. Supermarkets and greengrocers shelves groan under the weight of these delightful, nut-sized veggies. The most popular way to serve sprouts is to steam them. This is also the healthiest way as it retains the most nutrients. But there is growing popularity to roast them. Roasting Brussels sprouts intensifies the flavor and gives them an almost nutty taste. Popular still is the serving of the sprouts with a little bacon and possibly (if you like them) chopped chestnuts. No traditional meal in Britain ever seems complete without potatoes in some shape or form, and Christmas is no exception. These earthy, delightful vegetables will be there in at least two forms: that of a light and fluffy mash and without a shred of doubt, a bowl of crisp roast potatoes. It is not just the potato that gets the roasting at Christmas, hugely popular are roast parsnips. This sweet vegetable rises to greatness when popped into the oven, with or without a touch of honey (most good parsnips do not need the extra sweetness). There are not many sauces around the world which can claim the longevity of a sauceboat full of classic Bread Sauce. This lovely, thick, creamy sauce is an essential of the British Christmas table and the perfect accompaniment to turkey or goose. One of the new kids on the block in recent years is cranberry sauce, which has become more common, because of its popularity in the US. To some Brits, the cranberry sauce is too modern, but for most, it is now an essential part of the British Christmas table. The sauce can be made fresh or made into a delicious Cranberry and Port Relish, which will work both for Christmas and for Boxing Day meats. Jugs of homemade poultry gravy on the table are an absolute must for Christmas lunch. No substitutes allowed, as making a gravy from the delicious, meat roasting juices is what gives such a depth of flavor.